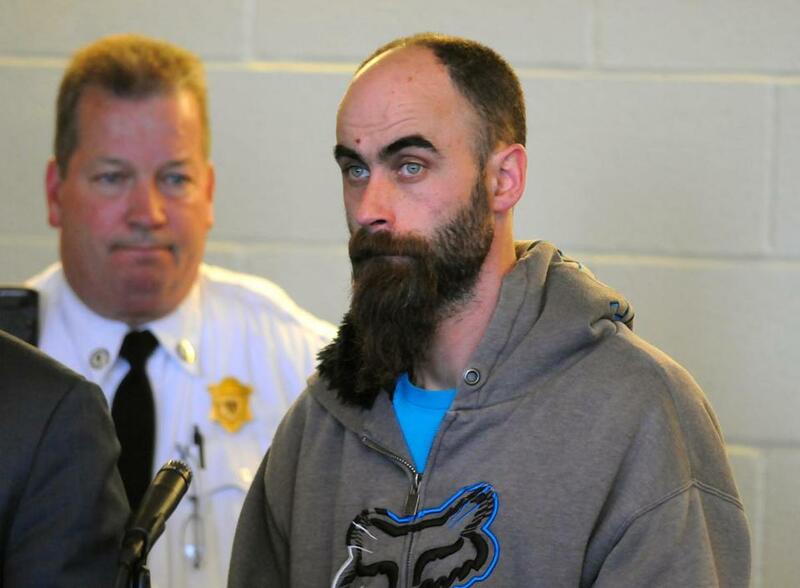 Timothy LaPierre was arraigned Friday in Plymouth District Court. PLYMOUTH — As she did almost every morning, Marjorie Cochrane started her day Thursday with a brisk walk around her neighborhood with her son’s dog, a black Lab, boxer, and pit bull mix named Sasha. The 69-year-old grandmother adored animals, and had lost nearly 100 pounds walking the dog 3 miles a day, her son said. But just before 8 a.m. Thursday, Cochrane was struck and killed near her home. Police have charged 39-year-old Timothy LaPierre, who lives just blocks away, in her death. Sasha also was fatally injured in the accident. LaPierre later told authorities he had heard a thud, but thought he had hit a dog and not a person. LaPierre pleaded not guilty in Plymouth District Court on Friday to charges of motor vehicle homicide by negligent operation, and leaving the scene of an accident causing personal injury or death, and was ordered held in lieu of $25,000 bail. Defense attorney Timothy Shyne said LaPierre saw a dog run from the scene and thought he may have hit it, but he knew nothing about Cochrane. Shyne said the vehicle’s impact probably sent Cochrane’s body over a snowbank, which prevented LaPierre from seeing her. His client attempted to follow the dog, Shyne said, but when it ran off, he believed it was fine and continued on to work. Shyne said that solar glare had limited his client’s vision. LaPierre, who has a long beard and was wearing a sweat shirt in court, listened intently throughout the hearing but showed no emotion. Three women who attended his arraignment left the court without speaking to reporters, and a manager at his place of work, Mayflower Service Center in Plymouth, declined to comment. He is scheduled to be back in court on April 8. 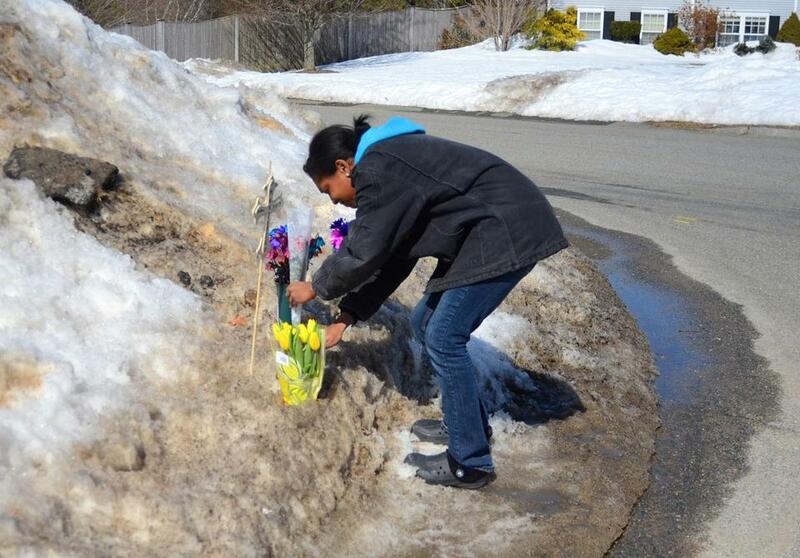 Neighbor Iyannah Tillman added to a memorial to Marjorie Cochrane at the Plymouth accident scene. Cochrane was discovered lying on Garrett Place by two men around 8 a.m., according to court documents. She had serious injuries to her face, and was losing blood, the documents state. She was taken to Beth Israel Deaconess Hospital-Plymouth before being transported by helicopter to Boston Medical Center, where she died of her injuries, according to authorities. The dog, Sasha, managed to run the short distance to Cochrane’s driveway, where its body was found. One of the men who found Cochrane told police he saw a gray Chevrolet Silverado pickup in the area, but was not sure it was involved in the accident. On Thursday evening, police discovered a gray Silverado with front end damage parked nearby, on Blueberry Road, according to the documents, and LaPierre reportedly told them it was his truck. LaPierre’s license was suspended by the Registry of Motor Vehicles following Cochrane’s death. He had been ticketed for speeding five times since 1993, and was involved in an surchargeable accident in Wareham in 2005 along with other traffic violations, according to the Registry. He was also prevented from renewing his license several times for failing to pay vehicle excise taxes he owed the town, records show. Cochrane’s son and ex-husband described her as a smart and kind woman who worked as a bank manager until retirement, and now worked a few days a week at Bank of America, just to get out of the house. She loved the rock band Queen and delighted in watching scary movies. Her family members could always tell when she had a really gripping movie going, because they’d come home to locked doors. She doted on her two granddaughters, both in their early 20s, and adored spending holidays with them. Rick Cochrane said he believes his mother never gained consciousness after being struck. On Thursday afternoon, bouquets of daffodils and purple and pink flowers were nestled in the snow at the corner where she was killed, along with a homemade cross. Cochrane’s death marked the region’s third fatal accident involving a pedestrian or cyclist in two days, officials said. On Wednesday, two women in their 60s died after being struck by large commercial trucks in separate accidents, authorities said. In Boston, a 69-year-old woman was crossing Charles Street from the MBTA’s Charles/MGH Station toward the Liberty Hotel shortly after noon when she was struck by a 32-foot tractor-trailer owned by Coca-Cola Enterprises, State Police spokesman David Procopio said. An ambulance crew stopped to help the woman and took her to nearby Massachusetts General Hospital, where she was pronounced dead, officials said. The tractor-trailer’s driver, a 38-year-old Saugus man, immediately stopped and tried to help the victim, and later cooperated with investigators. About an hour later in Cambridge, Marcia Deihl, 65, was hit by a dump truck as she rode her bicycle onto Putnam Avenue from the parking lot of a Whole Foods Market, where she had been shopping, authorities said. The driver, a 44-year-old Medford man who was not identified, may not have immediately realized he had hit a person, but he stopped as soon as he became aware, officials said. Globe correspondent Aneri Pattani and John Ellement of the Globe staff contributed to this report. Evan Allen can be reached at evan.allen@globe.com. Follow her on Twitter @evanmallen.